Regional leaders working to reduce homelessness do not fully understand the depth of the problem or the full cost of addressing it, according to a new study released Friday by Oregon Harbor of Hope. The Portland State University capstone study found that no one knows for sure how many people are homeless or on the verge of becoming homeless in metropolitan area. Nor does anyone know the full cost of serving the homeless, including helping them transition from the streets into permanent housing. "We wanted a fresh look at the homeless problem, and the capstone team report offers some real insight. We realize that the problem is bigger than we thought. We don't have a handle on the true number of homeless, or just how much this is costing the city and its taxpayers," says Don Mazziotti, executive director of Oregon Harbor of Hope, a nonprofit organization founded by developer Homer Williams that is working to open a homeless navigation center in the Pearl District. 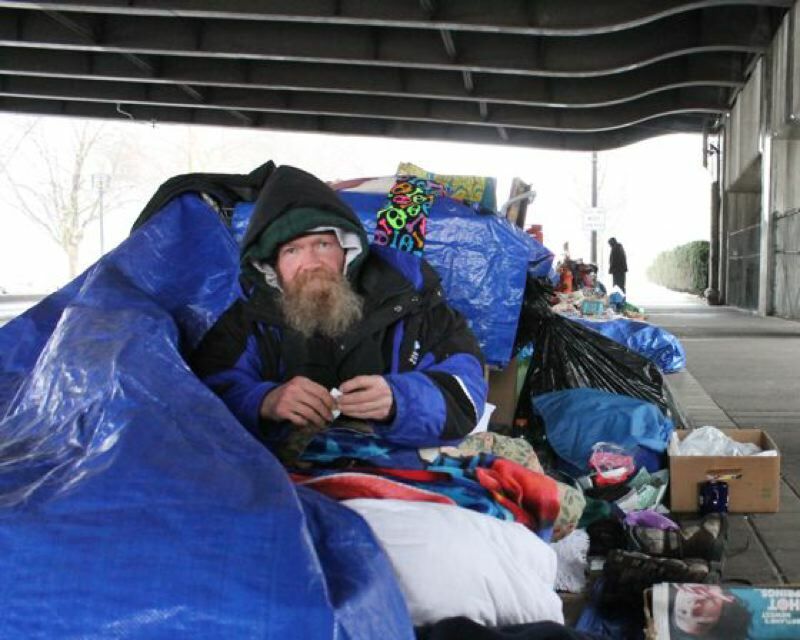 The Joint office of Homeless Services, which is funded by Portland and Multnomah County, disputes some of the findings. It released detailed spending on program, saying that it knows "exactly how much it costs to help the tens of thousands of people our partners serve every year." "Our outcomes make clear that those investments are helping record numbers of people — nearly 30,000, up from roughly 20,000 three years prior — leave the streets for housing, stay housed if they're on the brink of homelessness, or find a safer place to sleep in our shelters," the statement said. The 62-page study is titled "An Analysis of Homelessness & Affordable Housing, Multnomah County, 2018." It was conducted students in the PSU School of Business as one of the university's capstone graduation projects. • The Portland area's affordable housing and homelessness crisis was decades in the making, and government or market forces alone cannot solve it. • Multnomah County is short 29,000 units of housing affordable to households earning 50 percent or less of the area's median family income. That number is growing, as are the number of people who will need that housing in the future. • The semi-annual Point-in-Time Housing and Homelessness surveys consistently undercount the number of homeless, leaving out those who are doubling up with family or friends or who were incarcerated or hospitalized on the night of the street count. • The cost of homelessness is unknown when accounting for the full range of services. Other communities have estimated costs between $10,000 and $150,000 per person, per year. • Public-private partnerships are best positioned to offer solutions to construction of affordable units, but more can be done to reduce hurdles. "Understanding the extent and nature of these problems is important for aligning efforts and cultivating the resources needed to address these issues on a much larger scale," the study says. The homeless services office says it knows the semi-annual Point-in-Time surveys are not an accurate measure of homelessness. "The PIT is an important tool, but it's just one of the data sources we draw on to help people rebuild their lives. It's essentially just a snapshot. It doesn't tell us how many people enter or leave homelessness over the course of a year, or why people enter or leave homelessness," the statement says. According to the PSU study, "bold action is required if we are to have a meaningful impact." That requires collaboration between government, developers, concerned citizens, non-profit service providers, and faith leaders to deliver innovative and effective solutions. Among the recommendations is a shift toward more home sharing. A recent survey by the Trulia real estate company counted more than 42,000 unused bedrooms in the Portland area. These rooms could enable homeowners to 'age in place' by renting them to those in need. A public-private partneship is needed to connect willing homeowners with those in need. Portland and Multnomah County have prioritized the homeless and affordable housing crisis in recent years. The City Council has declared and extended a housing state of emergency every year since 2015. It has also partnered with the Multnomah County Commission to create the Joint Office of Homeless Services to increases funding for prevention, shelter and transitional program. The office spent $58 million for such services in 2017 alone, according to the study. The council has also significantly boosted funding for affordable housing housing projects. Among other things, it has increased the share or urban renewal funds dedicated to them from 30 to 45 percent. Portland voters also approved a $258.4 million affordable housing bond at the November 2016 general election that the council is now spending. Despite that, much more needs to be done, the study says. People continue moving to the Portland area, driving up housing costs. Communities of color and older citizens without sufficient incomes are especially vulnerable to displacement. There are not enough mental health services to help those affected by years of deinstitutionalization. And economic trends such as automation could eliminate many low-skill jobs in the future. To better respond, government needs to partner with the private sector and others to fully understand the scope of the current and future situation, and to create and fund innovative solutions. orchestrate these efforts," the study says.